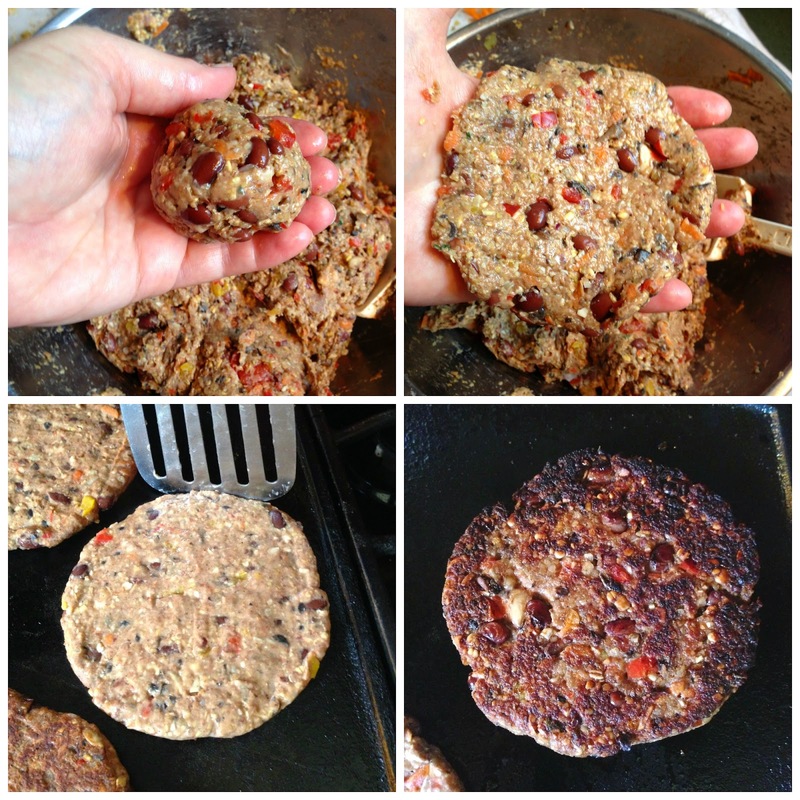 Go meatless with these delicious SMOKEY BLACK BEAN BURGERS (kid and husband approved)! If you're like me, you'll want to stock up. These burger patties freeze well once grilled, so they're a great item to stock up on in your freezer for those meals when you want convenience, but don't want to sacrifice your family's health. So gather 'round and let's get started! * Feel free to use one 15 or 16 ounce can of beans and re-fried beans if you don't want to make these from scratch. 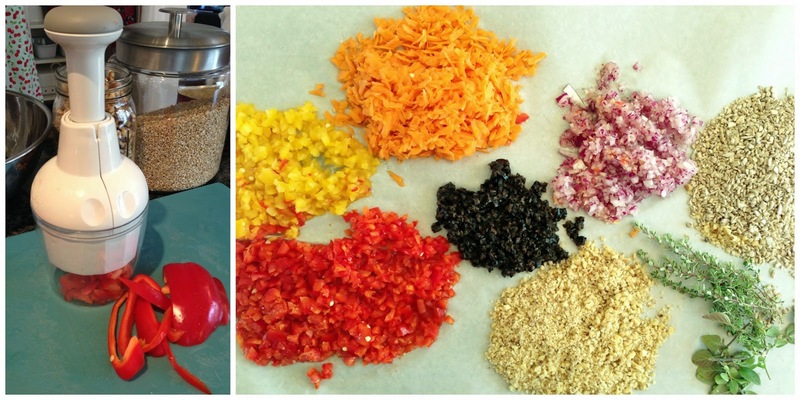 ** I like to cook up a batch of quinoa and keep it in my fridge to use in several recipes throughout the week. 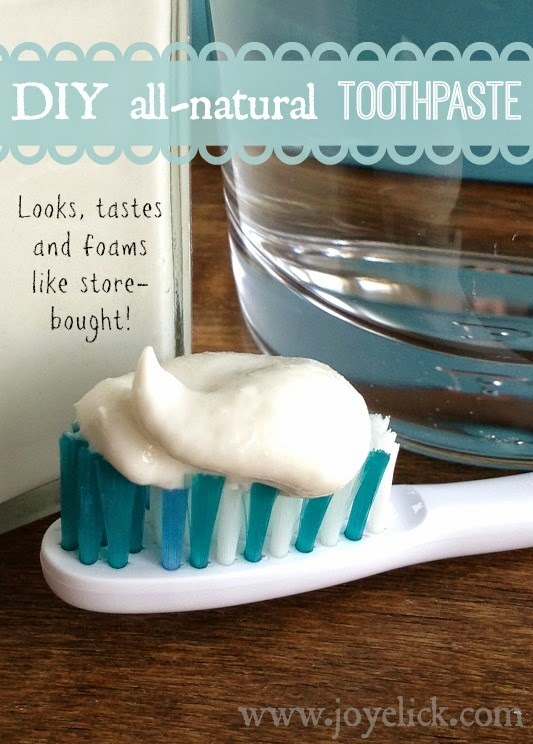 Feel free to skip this ingredient if you wish, it won't change the final product at all. Step 1: Prepare the beans. You can use canned whole black beans and re-fried beans if you wish. However, if you prefer homemade from dry beans, simply cook according to package directions. Once cooked, rinse and drain the beans. Mash some to make the called for re-fried beans, and leave the rest whole. 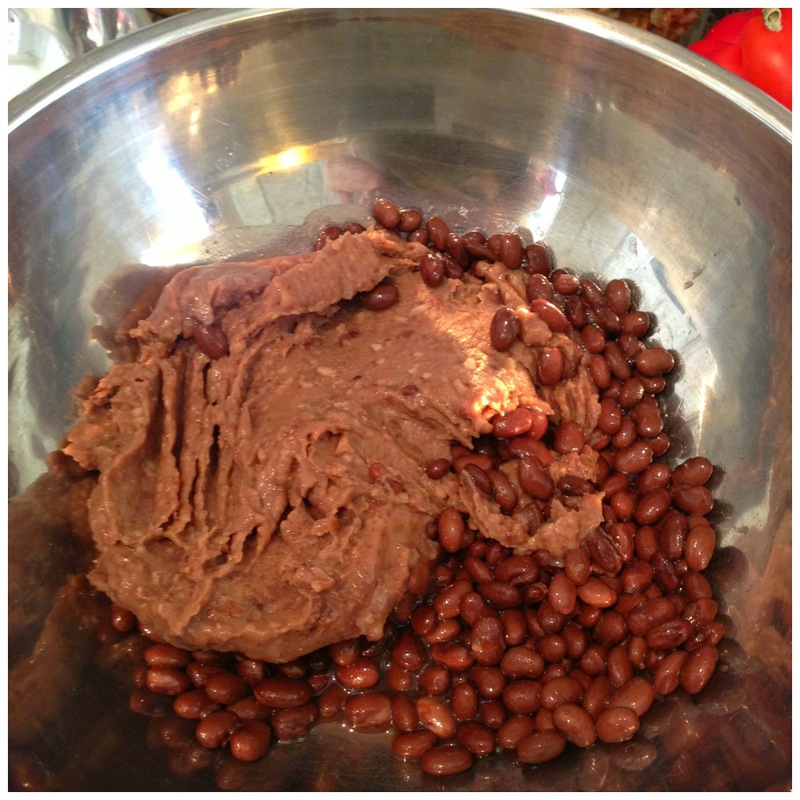 Place the called for amounts of both beans in a large bowl and set aside. 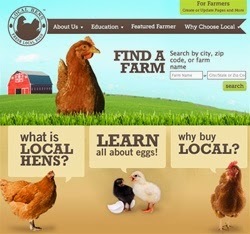 Canned or from scratch, it's up to you. Step 2: Chop and grate. 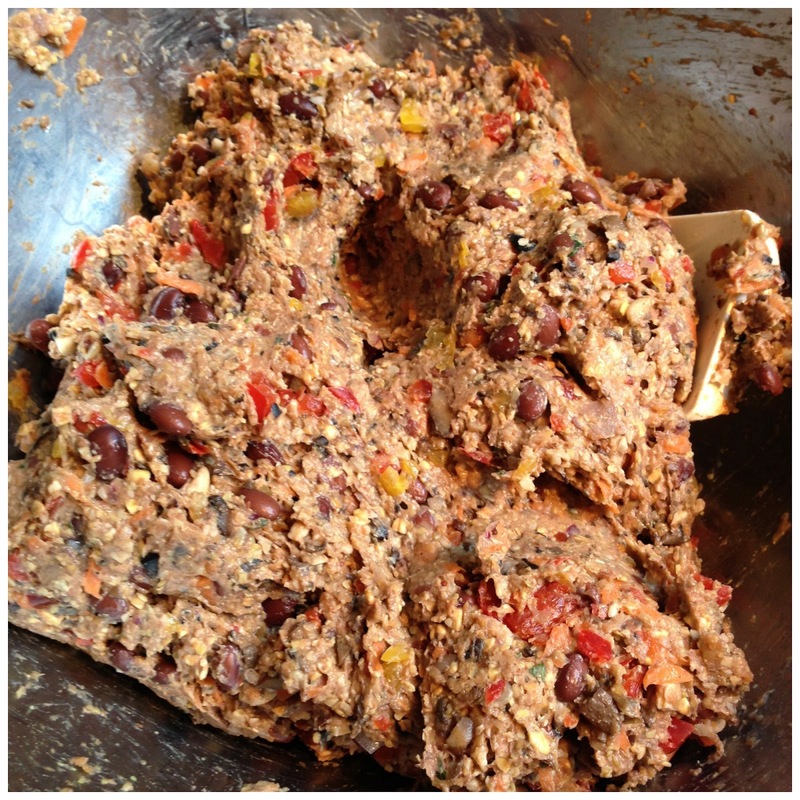 Using a hand chopper or food processor, finely chop each of the following ingredients--red onion, mushrooms, red and yellow pepper, olives, walnuts, sunflower seeds and fresh oregano. Next, grate the carrots. to dice the patty fixings up. Step 3: Saute. In a medium skillet, saute half the onions in a bit of oil. When the onions are browned, add the mushrooms. Saute the mushrooms with the onions until the mushrooms are also browned. Place these in the bowl with the beans. mushrooms for some super flavor. Step 4: Combine. In a small bowl, combine all the seasonings and herbs and set aside. 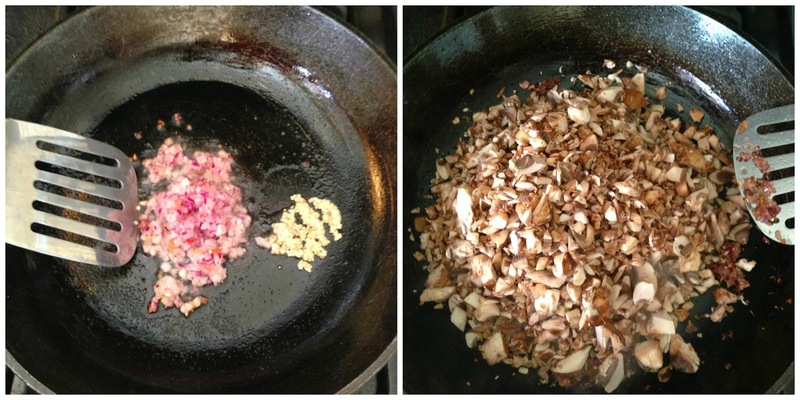 To the large bowl of beans and sauteed onions and mushrooms, add all the other patty fixing ingredients. Mix well with a rubber spatula. If you chopped things small enough, the consistency of the mix should appear much like ground meat. Sprinkle the seasoning and herb mix over the wet patty fixings. Thoroughly combine these into the mix. Now you're ready to form the patties. Step 5: Preheat a well oiled cast iron skillet or griddle over medium heat. (Cast iron works well for browning, but any skillet will work). Step 6: Form and grill the patties. Forming the patties is best done with water on your hands. Taking a slightly larger than golf-ball size ball of patty mix in moistened hands, press and flatten the ball between your fingers and palms until it forms a disk about the diameter of a softball and is about a 1/2 inch thick. Carefully place the patty on the griddle. Cook on a hot well oiled griddle. Use the side of the spatula that's been dipped in water to smooth and shape the edges of the patties to make them uniform and round. Carefully flip each patty every couple of minutes until both sides are well browned and slightly crisp. Keep warm on a plate in the oven until ready to serve. shaping them with the edge of a spatula. Step 7: Serve or save. Serve on a burger bun loaded with all the standard burger fixings you love. If you're stocking your freezer, simply let the patties cool completely on a wire rack, then layer the cooled patties between pieces of parchment paper and place in an air tight container to freeze. Later, when you want to use them, simply pull them from the freezer, reheat on a hot griddle just until warm, then serve. Use from the freezer within three months. Let's chat. 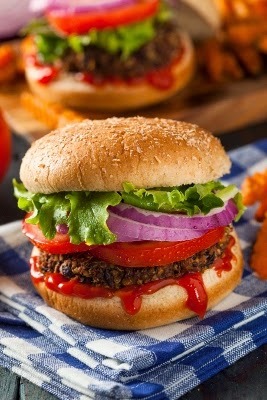 What meatless burger recipes have you tried? Do you have other meatless menu favorites? I'd love to hear from you in the comments below. I'll have to try this as a stealth recipe so my SO will give it a chance. It sounds great!